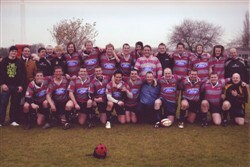 Olney RFC 1st XV, Southern Counties North League Winners 2007-08, colour team line-up photograph season 2007-08. Back row: R. Keenan, M. Boddy, C. Tomkins, J. Carr, R. James, R. Stewart (coach), M. Lay, G. Stanton, G. Cahill, J. Sutton, D. Henrickson, I. Bennet, S. Harrison, R. Duncan, D. Taylor, N. Deighton. Front row: A. Kelso, S. Howkins, D. Terry, W. Edwards, R. Peakman, O. Brackenbury, P. Dowsitt, D. Smith (Captain), C. Parnham, S. Fuller, P. Berry.